In addition to solving crimes, you can depend on Sheriff Dan Rhodes to do some bull wrestling in a Walmart parking lot. I don’t know how many people click the link at the end of the column to see the listing of the other Forgotten Books each of these installments. Patti Abbott, a very fine writer in her own right, compiles a listing each week (and when she’s not available, some other very fine folks make it). I have found some wonderful titles from the various listings. The listing for last week contained two that someone felt compelled to write about. I had read three of those titles and was aware of six others. The remainder were new to me or had never been on my radar. I will be checking out several more of them as the year moves forward. Among the people who write the various Forgotten Book and Forgotten Film columns each week, Bill Crider is a prominent force. To the general reading public, I’m not so sure. He has written a lot of books over the years but he has not achieved household name status. And that is the shame. I have posted about other Crider titles over the past five years, including A Vampire Named Fred and Mike Gonzo and the Sewer Monster. These were young adult books I really enjoyed. In addition to them, Crider has written mystery novels in five different series, men’s adventure novels, horror novels, western novels, a Nick Carter-Killmaster novel and some pseudonymous things he is very tight lipped about. 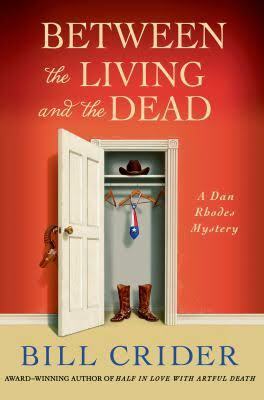 The Sheriff Dan Rhodes series is the biggie among his mystery novels. The series currently stands at 23 books (there is another being prepped for publication). Rhodes was his first series character, beginning with Too Late to Die (1986). Rhodes, the sheriff of Blacklin County, Texas, works out of Clearview, a smallish town with its share of wonderful characters. Between the Living and the Dead begins with the death of Neil Foshee, a local meth dealer, at the local haunted house. Everyone knows the house is haunted. It has been empty for years. The last owner died alone there. So, over the years the stories about the death have grown and expanded. Sheriff Rhodes knows the facts, but locals don’t want facts to get in the way of their stories. Local math professor/singer/amateur PI/character C. P. “Seepy” Benton provides some fun comic relief to the proceedings, as he has set up Clearview Paranormal Investigations (CPI) and offers his “expertise” to the county for a potential law enforcement endorsement. Foshee’s two cousins have just gotten out of jail on bail, so they are potential suspects. But then so are Neil’s former girlfriend and her current boss/boyfriend, the mayor, the mayor’s wife and the mayor’s nephew. And when the skeleton shows up, the whole thing changes. In addition to looking for murderers, a small town sheriff has to deal with lots of things like chasing suspects on foot through the woods and then avoiding the rampaging hogs or wresting a bull in the Walmart parking lot after it charges a small child. He has to deal with the his bickering employees and their relationships. And, of course, he has to deal with the dangerous drivers in Clearview who do not use their turn signals! Crider captures that small town feeling and atmosphere superbly. Over the course of these books, you get to see the wondrous nature of that small town and come to care about many of the folks. I’ve known Crider for about 40 years. I’ve read many of the books in this and the other series. They are great go-to books when you need a good solid read that puts a smile on your face and happiness into your heart. I don’t think I tell him enough how much I love his books, so hopefully he gets the idea now. Thank you, Bill, for these books.